One reason I love blogging so much is that I have discovered so many amazing blogs and bloggers. Today I'm going to be sharing 10 of my favourite blogs you should all be following! It has been hard to narrow it down to ten since I love reading so many blogs, but I'm thinking of making this a more regular feature on my blog so I can mention more of you! Lily's blog is one of the first I started reading when I began blogging - what feels like a really long time ago! It has been so lovely to watch her blog grow and grow since then. Meet Me In Melford is in fact still one of my favourite blogs today. I love her blog design and find the Mixtape feature really unique, I love it! Like Meet Me In Melford, Emsi Rose's blog seems to be another one I've read since forever. She is such a lovely person and I especially liked her I Feel Beautiful posts she wrote recently. She also has started a YouTube channel you must all go and subscribe to, it's amazing! Jade is one of my best blogging friends, so not only do I love reading her blog posts, she is so great to chat to! I've felt so proud as her blog following has grown so much lately. 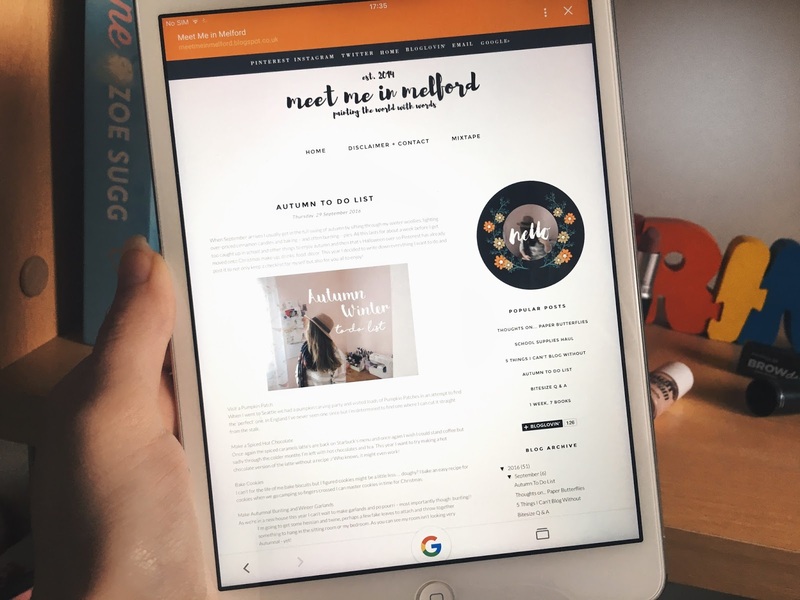 This month she is doing a guest post month which although it makes me sad that we don't get any new posts written by her for a whole month, we can discover more amazing blogs so it's a great idea! May I first of all mention how beautiful Tilly's blog photos are! Major heart eyes, the quality is unreal! I discovered her blog through Instagram (no wonder why I clicked because of her lovely photos) and I get so excited for her new posts now! I especially love her fashion posts like this one. Another blogger with great photos! I love Eleanor's fashion posts and also her more thought provoking ones, such as her recent post about letting go. I'm also very excited for posts from her #anewageinspiration project, it's such a unique feature for her blog! 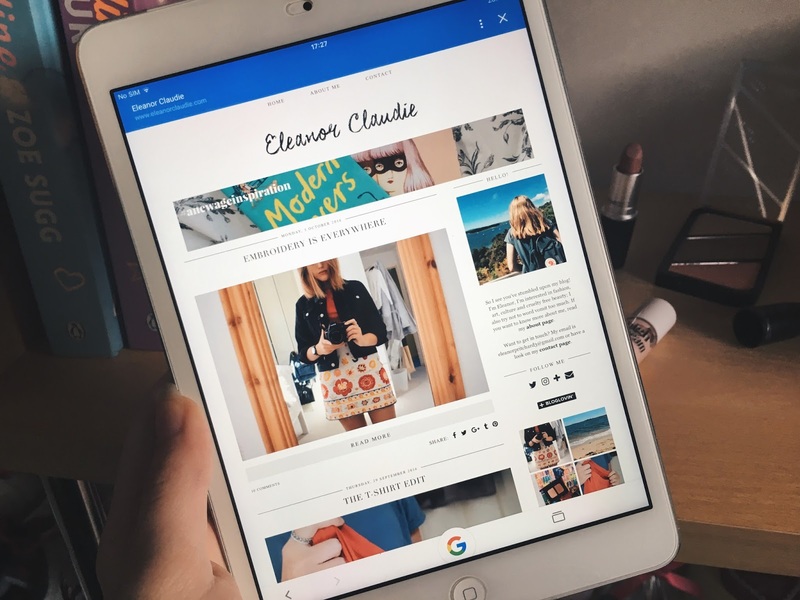 I've read Olivia's blog since her first few in May 2015, and since then she's gained almost two thousand followers on Bloglovin', such an amazing achievement and one reason I aspire to be like her! There's definitely a reason why she has so many followers, it's her amazing blog posts! I really love her makeup reviews in particular, like this one about her new Urban Decay products. How could I write a post about my favourite blogs and not include Nicole's incredible blog, Thrifty Vintage Fashion? Her blog is full of blog tips and her thoughts and experiences of mental health. She writes about important issues more people need to talk about, definitely worth reading. If your after a fashion blog, Alex Rooke should definitely be your go to. Her outfits are always amazing and put together so well. I especially love the photos she took in California, the backdrop is incredible. She is yet another blogger with amazing photography, if only I knew her editing tips! I discovered Lauren's blog through the teenage team and it has to be one of my favourites. Sometimes she writes thoughtful ones such as a poem she wrote lately, I really reading enjoyed that! You must make sure to subscribe to her YouTube channel when you check out her blog, she's so fun to watch and I especially love her 'Tea and Talk Tuesdays'! Alike myself, Grace blogs mostly about beauty and I love to hear what her current favourite products are! Recently she has shared her Top £10 under £10 makeup which is perfect for those of you on a budget. I must also mention that her blog header is so cute, I love it! Thank you so much for mentioning me, glad you like my header because at first I didn't know whether people would like it. I will definitely check out some of these bloggers!